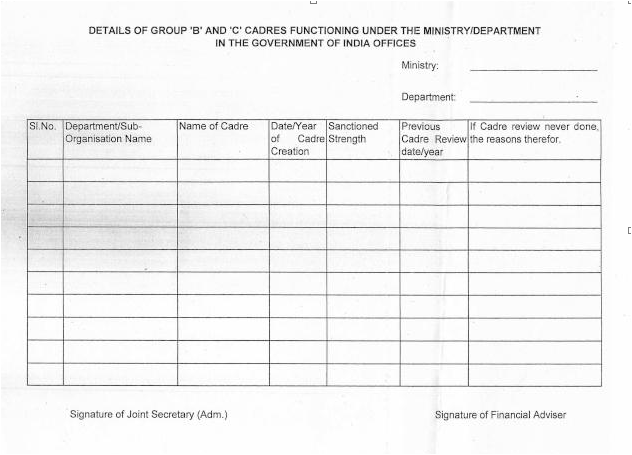 Sub: Details of Group ‘B' and ‘C' Cadres Functioning Under the Ministry/Department in the Govt. of India Offices - Compilation of Data - reg. The undersigned is directed to enclose herewith DoE OM No. 2(82)/E.III Desk/2017 dated 19.12.2017 on the above mentioned subject. It is requested to furnish the desired information to DoE latest by 31st January, 2018 under intimation to IFD. 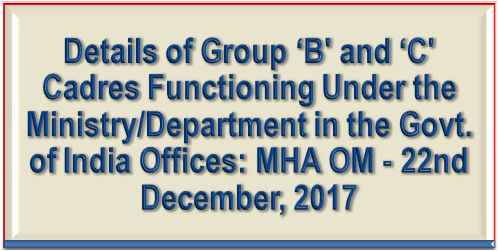 Subject: - Details of Group ‘B’ and ‘C’ Cadres functioning under the Ministry/Department in the Government of India Offices-compilation of data: regarding. This Department deals with Cadre Review cases of all Group ‘B’ and ‘C’ Services/Cadres functioning in or under the Ministries/Departments of the Government of. India Offices. In this connection it has been decided to compile data to set up a data-bank of all Group ‘B’ & ‘C' Services/Cadres under Government of India. All Fianacial Advisers in the Ministries/Departments are therefore requested to provide information relating to all Group ‘B’ & ‘C' Services/Cadres functioning in under their respective Ministries/Departments in the enclosed format latest by 31st January 2018. The Ministry/Department-wise information may sent trough e-mail to useiiidesk-doe@nic.in. All Fianacial Advisers in the Ministries/Departments are therefore requested to provide information relating to all Group ‘B’ & ‘C' Services/Cadres functioning in under their respective Ministries/Departments in the enclosed format latest by 31st January 2018.